Nepal Earthquake 2015. On 25 April 2015, 9,000 people were killed and over 23,000 injured when an earthquake of a magnitude of 7.8 hit Nepal. Flattening houses and villages it left hundreds of thousands of the people of Nepal homeless. 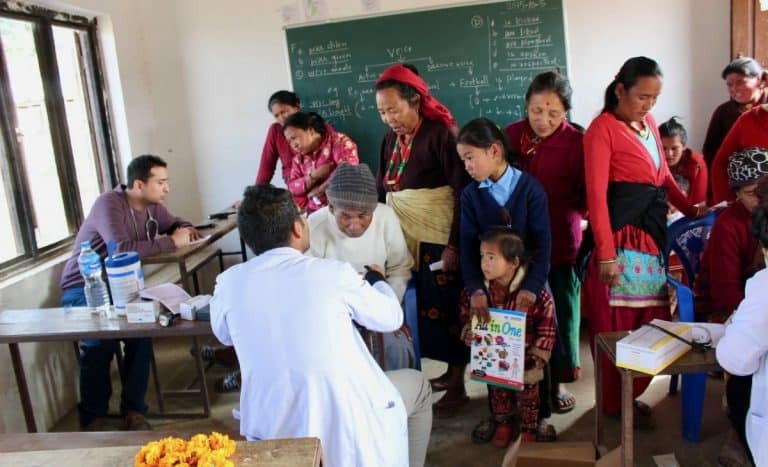 Partners of CHANCE for NEPAL were able to bring help – support and supplies – to remote hard-to-reach villages. In post-earthquake Nepal, the charity’s vital work continues to rebuild lives. 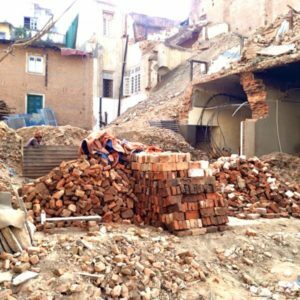 Barbara Datson, Founder of CHANCE for NEPAL, reports on the charity’s response to the 2015 earthquakes which devastated Nepal. 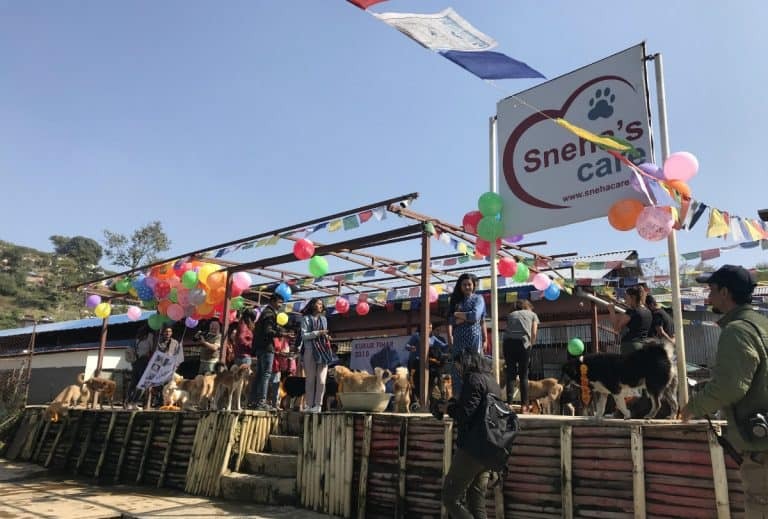 The Nepalese people are well known for their stoicism and resilience but just when they were beginning to move back into their homes after the initial Nepal earthquake on 25 April 2015, and shops began to open for business, another major Nepal earthquake hit on 12 May. Many houses still standing after the first earthquake were brought down by the second. Following the Nepal earthquake, the International Community, the Nepalese government, the police, charities in Nepal and the Nepalese people were stretched beyond their capabilities trying to reach the more remote villages and bring aid as quickly and efficiently as possible; and then to set about the massive task of rebuilding. 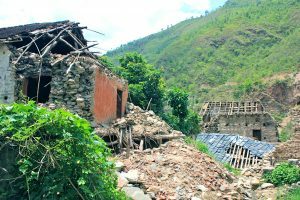 CHANCE for NEPAL set up an immediate online SOS Nepal Earthquake Emergency Relief Appeal which generated nearly £25,000 in donations. 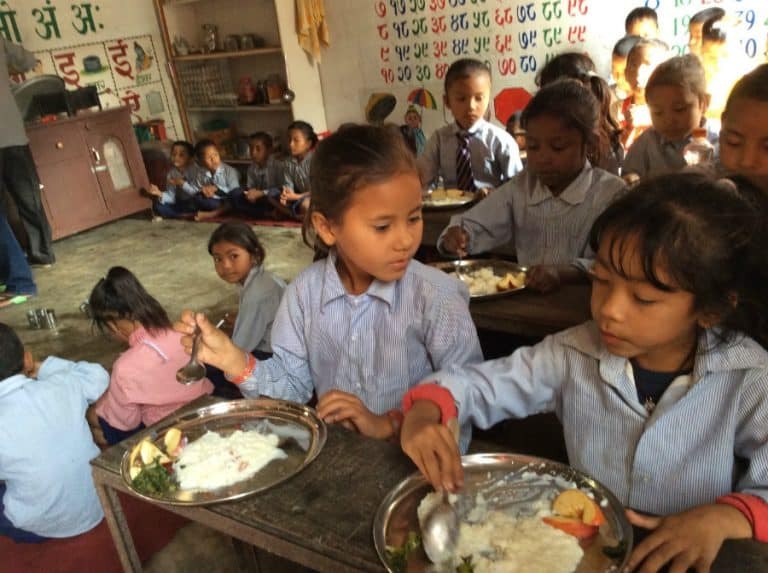 The majority of CHANCE’s appeal funds have contributed to the ongoing rebuilding of homes and schools decimated in the Nepal earthquake: for example, a new wing at Pegasus English School. 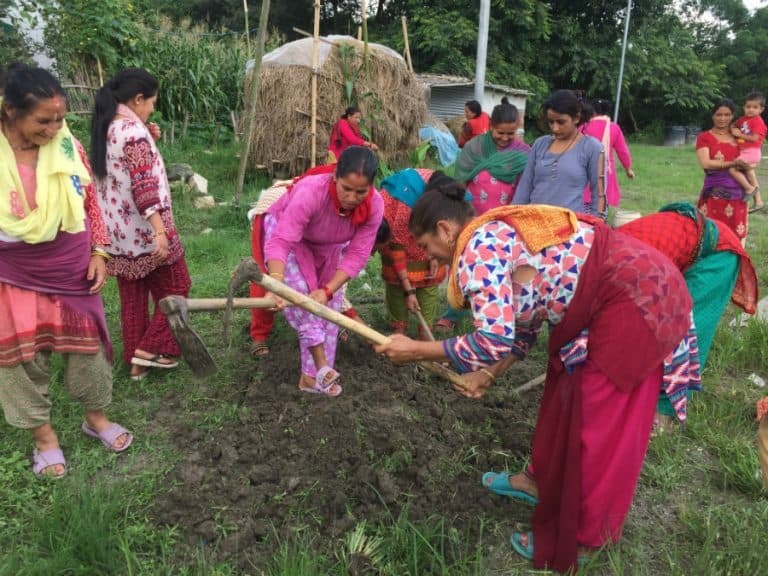 In addition, CHANCE for NEPAL sent out £4,000 to fund relief aid trips, providing water, food and shelter. 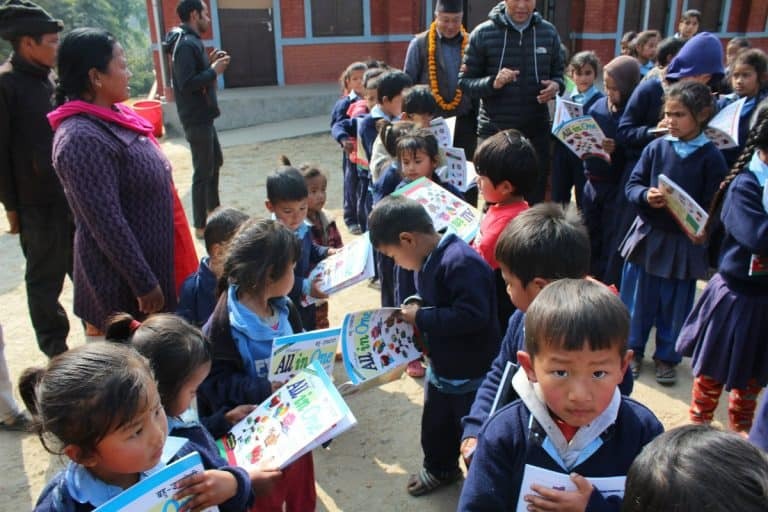 Vital Nepal earthquake relief aid trips were organized: two by Triple Gem School and three by Pegasus English School – both schools are supported by CHANCE. The earthquake destroyed many homes in Dhola, which lies 100km from Kathmandu in the district of Dhading. This is a Tamang community where many lives were lost. SHENPEN is constructing 55 homes here and CHANCE for NEPAL is funding a ‘Tiffin” meal for all the children. This will be monitored regularly by SHENPEN our partner on the ground. Of course, CHANCE for NEPAL’s own projects were badly hit too. At Triple Gem School, the building for younger children was badly damaged and not safe. 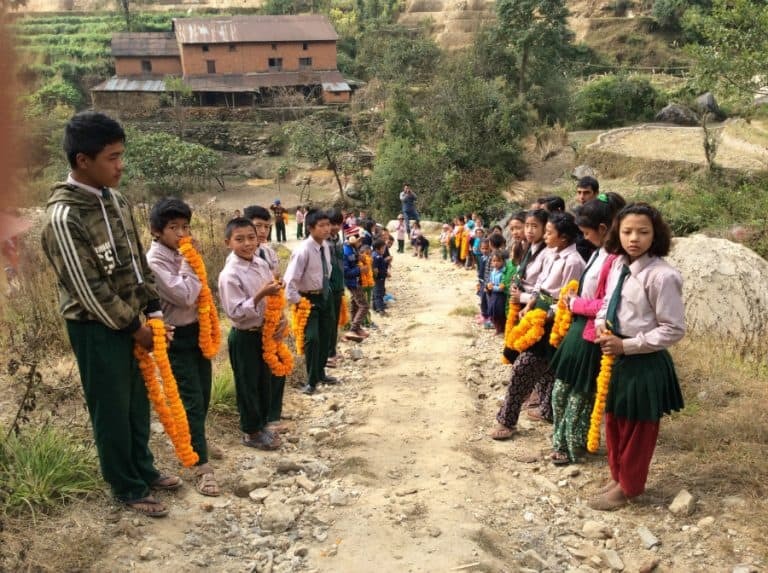 Lama Kondan, the headmaster, managed to rent a small piece of land adjacent to the main school and CHANCE for NEPAL sent £2,300 to build semi-permanent classrooms with a playground. And one of CHANCE FOR NEPAL’s pupils, sponsored from England, tragically lost his life in the Nepal earthquake, so the charity founded a memorial cup, the Ajay cup, in his name, to be presented to the best overall sportsperson. A fitting tribute to Ajay who loved sport. 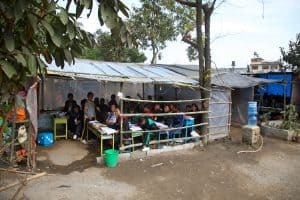 Many classrooms which were affected by the earthquake are still operating under canvas as the school buildings are unsafe and have not been repaired. At Pegasus English School, the classrooms on the third floor were lost in the Nepal earthquake. 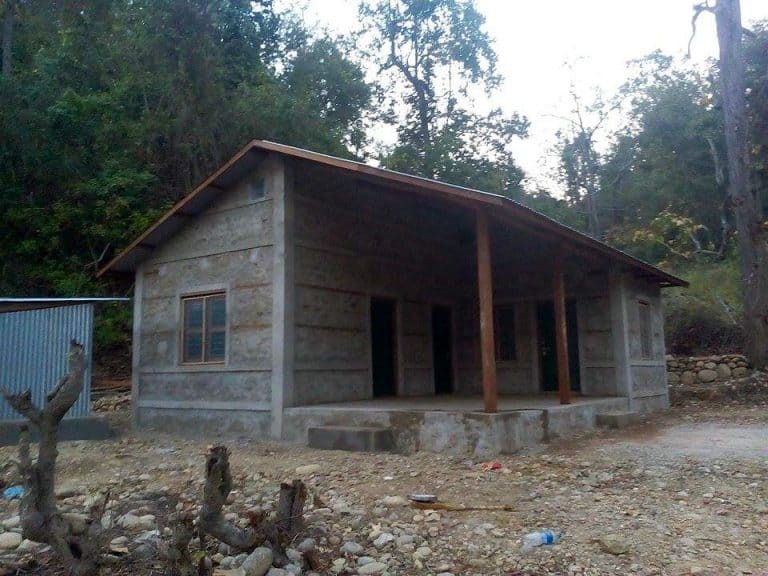 A permanent, earthquake-safe wing of two classrooms and a multi-purpose storage room were built. The new wing contains two new classrooms, one of which houses 18 new computers and screens along with a generator; the other is an all-purpose classroom and added a storage room. The Rivers Trust and Astor Hostels funded this through CHANCE for NEPAL. 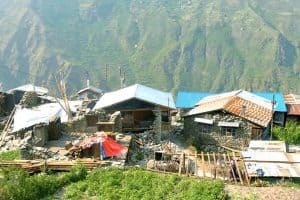 The long-term effects of the devastating Nepal earthquakes continue to be felt by the people of Nepal and CHANCE for NEPAL will continue to help the people who suffered so badly.